In conjunction with the Orange County Third Sector Alliance, the United Ways’ Nick Allen and John Oguntoye collected data with 103 Orange County nonprofits to learn more about the demographic characteristics of the leaders and their organizations’ assets and revenue. It is important to note that the 103 organizations include large foundations such as the Brady Education Foundation, William R. Kenan Jr. Fund for Ethics, and the Morgan Creek Foundation, as well as 48 small nonprofits with neither assets nor revenues, including Friends of the Orange County Public Library, Grape Arbor Development Corporation, and Reentry Pathway 4 Success. 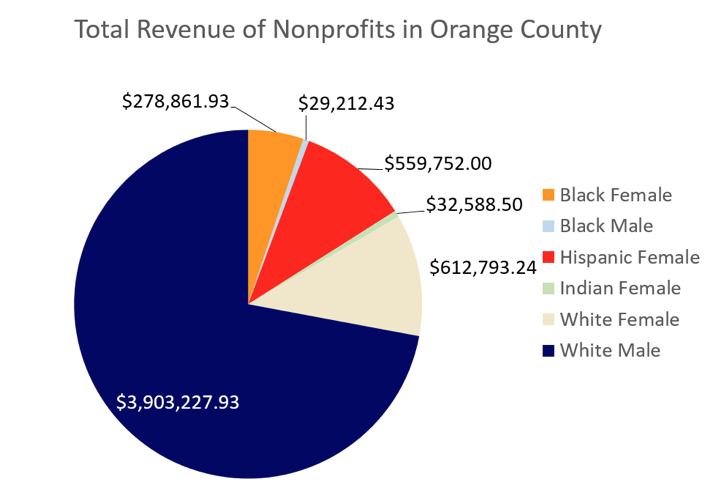 The majority of the leadership of the Orange County included nonprofits are White women (see figure 1; 48%) but the assets of their organizations (and everyone else’s) are far outstripped by the assets of the 26 organizations that are run by White men (Figure 2). As defined in the presentation, “assets are the real and depreciable property used in the business (cars, buildings, land, etc.…).” In Orange County, organizations lead by White men have average assets of $6,648,446 vs. an average of $1,601,630 for White women and an average of just $636,309 for Black women. Revenues, or the total amount of income of an organization, are similarly disparate (Figure 3). How does this impact relationships with the community? How does this impact organizational make-up? How does this impact the ability to secure resources? During the discussion that followed the presentation, one attendee suggested that the Towns of Carrboro, Chapel Hill, and Orange County ask for demographics of leadership in applications for their Outside Agency funding. I might add to also include that information for applicants’ boards. This is something that the Z. Smith Reynolds Foundation does in their funding applications. This information could be listed when funding decisions are released. The Guilford County Board of Education does something similar when they list the race and ethnicity of all businesses they contract with – including the White-owned ones, thus making the invisible visible. Note: Thanks so much to Nick Allen and John Oguntoye for generously sharing their data and presentation slides. For folks who are interested, John Oguntoye of the United Way of the Greater Triangle explains below how his team selected nonprofits and why many organizations had no assets or revenue listed. The nonprofits were selected based on NTEE (National Taxonomy of Exempt Entities) codes. NTEE are applied to every nonprofit based on the type of organization and their activities. From there, we selected NTEE codes that focus on human services. For the few organizations that haven’t been included, this is due to the fact that they hadn’t filed their 990 yet at the time that we downloaded the IRS datasheet of nonprofits, or their NTEE code does not fit a human services code. For the IRS Datasheet, any nonprofits that have below $25,000 assets or revenue are not required to report it to the IRS. This is why some organizations are listed down as having no assets or revenue.